Amazon sells virtually every product available, however, many people forget that the company began as just an online bookstore. Despite all the different products they carry, books remain a massive part of their business. So, if you want to sell books on Amazon you’re making a good choice. That being said, there are a few things you need to know if you plan to give this business venture a try. Every niche is a little different, so make sure you do your research beforehand. If you’re wondering how to sell books on Amazon keep reading. We’ve put together this comprehensive resource to fill you in on everything you need to know about selling books on the world’s largest online retailer. Is it Worth it Selling Books on Amazon? If you’re worried about investing a ton of time in the process, don’t be. One thing that makes Amazon a good place to sell books (or any product for that matter) is how easy it is to create an account and set up your listings. The process is extremely quick and you’ll be up and running in no time. The other consideration is profit. Even when selling used books you can still make about $5 per book if you manage your costs correctly. And new books, textbooks, and other more expensive items can yield even better margins, so there’s definitely money to be made. Finally, selling books on Amazon is a great way to start as an Amazon seller. Lots of people have used selling books as a jumping off point for larger Amazon businesses. So, if you’re interested in selling on Amazon and wondering how to get started, selling books is a great way to do so. The first step to selling books on Amazon is to set up your seller account. Luckily, Amazon has made the process extremely easy and straightforward. 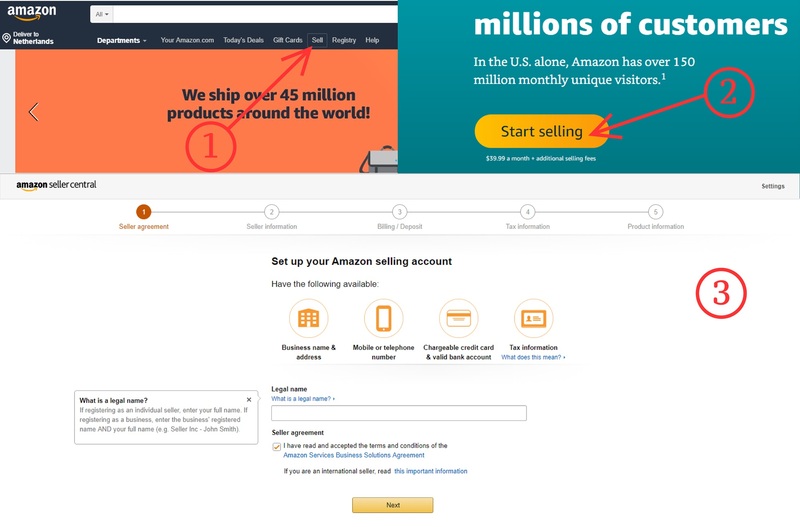 There are a few different ways to get started, but the easiest is to simply go to the Amazon.com homepage and click the “Sell” link at the top of the page. The first thing you’ll need to decide is whether you’re going to be an Individual Seller or a Professional Seller. There are a few important differences between the two. Individual Sellers pay no monthly fee. Instead, they pay a $0.99 fee for every item that they sell. They also are unable to set their own shipping rates. Individual sellers are typically people who have a small or limited supply of products. If you’re just looking to sell a few used books you have lying around the house this is likely the right choice for you. 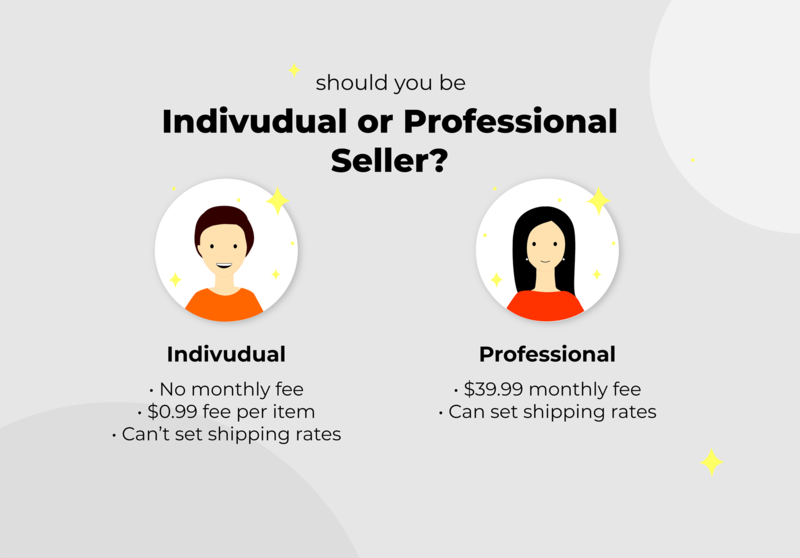 Professional Sellers pay a monthly fee of $39.99, but they pay no additional fee for the items they sell. They can also set their own shipping rates. Professional Sellers are generally people who expect to move a large volume of products per month. If you expect to sell more than 40 books a month this option will likely end up being cheaper. Once you’ve decided which option suits you best, follow the instructions to complete the signup process. You’ll need to provide Amazon with your legal business name, address, contact information, email address, an internationally chargeable credit card, a phone number (you will be contacted during the registration process so have your phone nearby), and your tax identity information. Fulfilled-by-merchant (FBM): With this option, you’ll pack and ship all the books yourself. This can be a lot of work, but if you have the time and resources it can save you money. Fulfilled-by-Amazon (FBA): You’ll ship your books to Amazon and they’ll store them at their fulfillment center, pack them, and ship them for you for an extra fee. While the added cost will cut into your profits, this can be a great option for new sellers, or people who don’t have the time to pack and ship orders themselves. Amazon Vendors (AMZ): This service allows you to sell your inventory directly to Amazon. Naturally, you’ll make less money through this method since Amazon will need to resell your books for a profit. However, if you need to unload a large amount of inventory fast this can be a good option. The registration process takes roughly an hour. Once you’re done it’s time to start building your product inventory and creating your listings. Realistically, most of the books you sell on Amazon will be used books, but luckily there’s still a huge market for them. There are also a lot of options for sourcing used books. Used books stores generally don’t offer prices low enough to turn a profit, but certain sales can provide good opportunities. Look for clearance sales and stores going out of business, as these usually lead to the lowest prices. 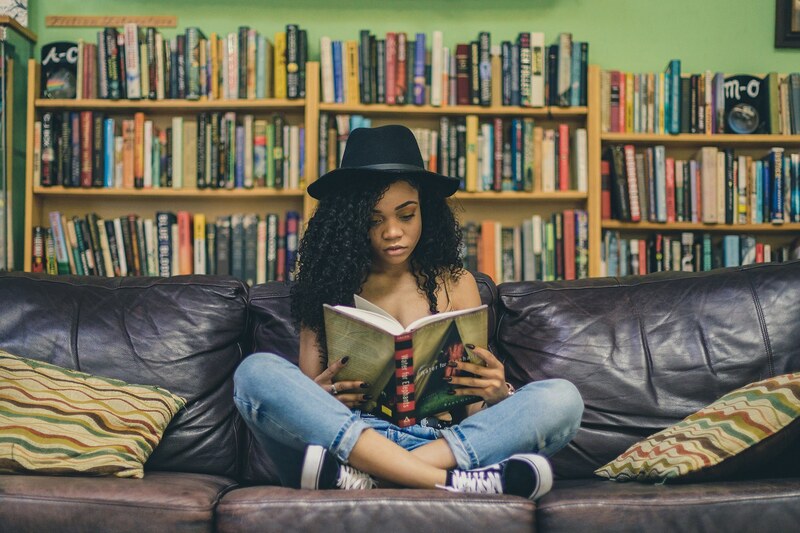 In addition to book store sales, you can also find used books at library sales, yard sales, and estate sales, and other online retailers like eBay or Craigslist. Thrift stores often sell books for extremely low prices, and churches and schools sometimes accept books as donations and then sell them for pennies on the dollar. In order to know whether or not you’ll be able to make a profit on a book, you scan it with your phone using either the Amazon Seller App or the Scoutify App. These apps will be able to tell you what the book is currently selling for on Amazon, and give you an estimate of your profits. If the idea of scanning book after book seems too much you can always buy in bulk. 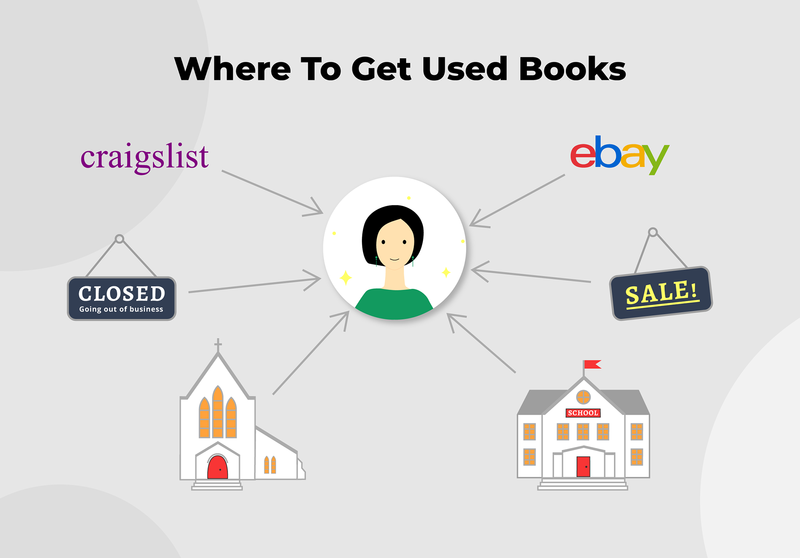 With this method, you need to find sellers who are desperately looking to offload a large number of books and offer to buy the whole lot. This can work quite well at the end of sales when sellers have a large amount of inventory that has yet to be sold. Sellers will often accept below market value for the books just so they don’t have to deal with all that inventory. You’ll likely end up with a fair number of duds, but if you pay a really good price for all the books you’ll still make a great profit on the books you end up selling. Remember, used books sell for less than new books (generally around $7 - $8), so it’s even more important to get used books for a good price when you plan on reselling them. Try to buy used books for $1 or less. This should give you a profit of around $5 after you factor in Amazon’s fees. Finally, you’ll also want to inspect each book’s condition. Try to avoid books with heavy wear or writing in them, as this will drastically decrease the amount you’ll be able to resell them for. When most people think about selling books on Amazon, they imagine selling used books. However, there are plenty of people selling new books as well. Sourcing new books can be a little more difficult, so it’s not recommended for new sellers. Still, it can be very profitable if you’re willing to put in the time and effort. Wholesalers are usually the best source for new books. These companies buy large numbers of books from publishers for super low prices. Because of this, they are able to offer much lower prices than retailers. 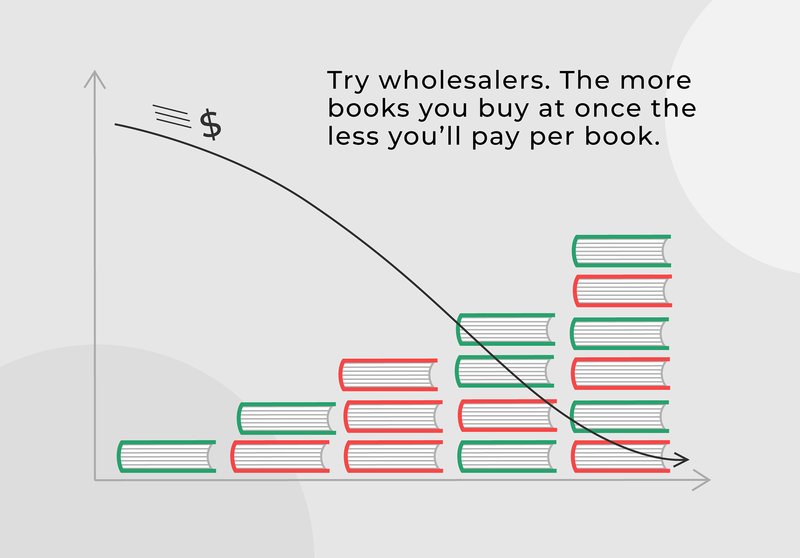 However, the amount you pay depends on how many books you’re willing to buy. The more books you buy at once the less you’ll pay per book. Most wholesalers have a minimum order, so you’ll likely need a fair bit of capital to make this strategy work. Distributors are another option. They’re always looking for new retailers to work with and may come to you once you’ve established yourself. They won’t offer prices quite as low as wholesalers, but you should still be able to make a profit. Oftentimes, distributors pay publishers to have exclusive rights to books, so for certain titles they may be your only option. If you have a lot of spending power and are willing to make a large investment you can also buy directly from publishers. This will drive the price per book down even further since you’re cutting out the middleman. However, generally publishers will only sell to you if you’re willing to buy thousands of books at once. One of the best parts about selling books on Amazon is how easy it is to create a listing. Listing books on their website is even easier than other products. In most cases, your book will already be listed on Amazon which means you won’t actually have to create a listing. To see if your book is already listed, search for its ISBN. You can generally find this on the book’s copyright page. Once you’ve found your book on Amazon, go to the listing and click the “Sell on Amazon” button, located on the right side of the screen. From there you’ll be taken to a form. You’ll need to input your price, how many copies you’re selling, and the condition of the book. If you’re a new seller with little or no reviews you may want to list your books at a lower price than your competitors to begin with. 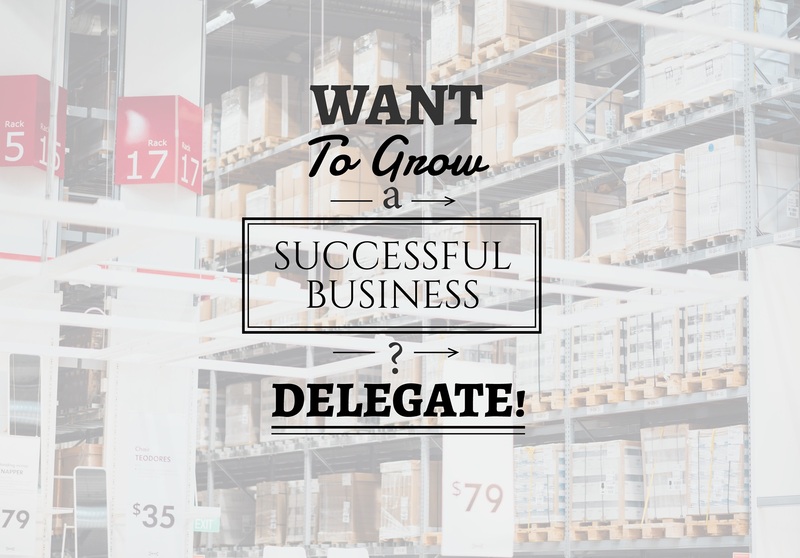 This will help you generate some early sales. If you price your book lower than everyone else’s then you’ll also earn the Buy Box. This means when someone simply clicks the “Add to Cart” button they’ll be buying your book. There are several different options when it comes to condition: New, Used - Like New, Used - Very Good, Used - Good, and Used - Acceptable. 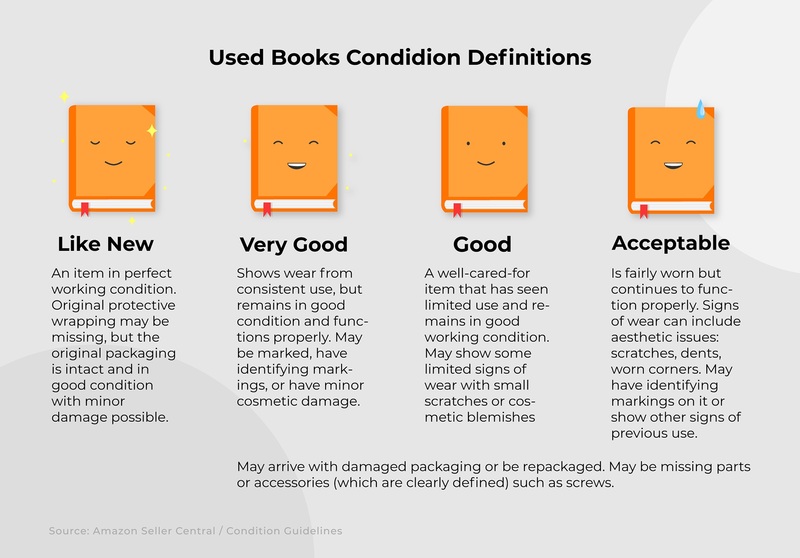 Read Amazon’s description of each category and be honest about the condition of your books. Otherwise, you’re likely to get a large number of complaints and returns. In the rare case that your book isn’t already listed, you’ll need to create a listing from scratch. This process takes a little longer, as you’ll need to take photos of the book and write the description. Most of the time though, you won’t have to worry about this. Once all the information is filled out, click “Save and Finish” and you’re done. Your book will now be listed on Amazon and you should hopefully start to see the sales roll in. We’ve laid out the basic steps you need to take to set up your account, find books to sell, and create your listings. But if you really want to find success selling books on Amazon use the tips and tricks listed below to gain an edge on your competitors. Lots of people are asking how to sell textbooks on Amazon, and for good reason. Selling textbooks is just like selling regular books, but they generally sell for a lot more which means better profit margins. Plus, college kids usually don’t think ahead and wait until the very start of the school year to buy their books. Because they need them right away they’ll often be willing to buy them at a higher price if you’re able to deliver them quickly. The Best Seller Rank (BSR) is a great way to determine whether a book is worth selling on Amazon. The higher a book’s BSR is the more popular it is. You may think that you want a higher BSR, but that’s not necessarily the case. Books with a really high ranking also have higher competition, which can make it hard to sell your books for a decent price. Conversely, a BSR that’s too low means the book isn’t very popular so it could take a long time to sell. Aim for books with a BSR between 10,000 and 200,000. Unless you have some sort of distribution channel in place, or you’re only planning on selling a small number of books, choose the Fulfilled by Amazon (FBA) option to fulfill your orders. Packaging and shipping orders can be extremely time-consuming, and as your orders start to increase you might start to fall behind. This can limit the number of books you’re able to sell and might result in poor feedback if shipping is delayed. With FBA, simply send all your inventory to the Amazon fulfillment center and let them take care of the shipping for you. You’ll have to pay an extra fee, but in the end it will likely be worth it. Providing excellent customer service can be the difference between a good Amazon business and a great one. Assuming you're honest about the condition of the books you’re selling, you shouldn’t have to worry about poor customer feedback. 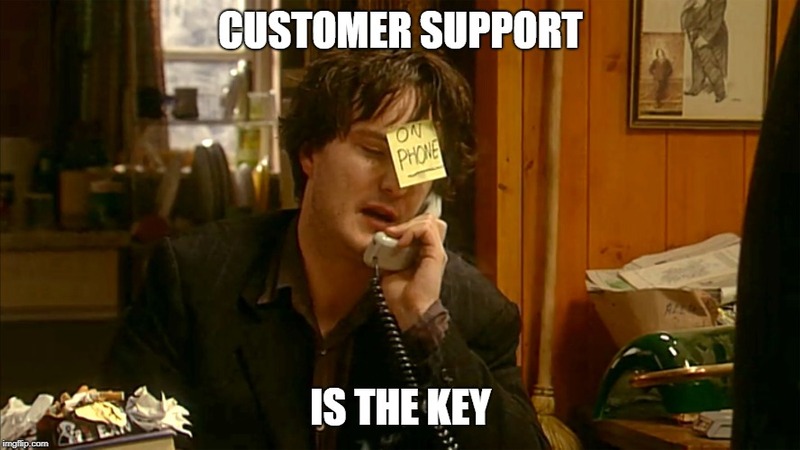 However, there are still a few things you can do to improve customer service. This includes using an automated email service to follow up with customers after they make a purchase and making sure you reply to all messages within 24 hours. If you’re looking to start your own business, want to make some side money, or simply want to experiment with online selling, selling books on Amazon is a great choice. Like any business venture, it requires some time and effort. But if you apply yourself and are serious about making it work you can certainly find success if you utilize the right strategies. Once you’ve mastered selling books on Amazon you might want to consider selling other products as well. You can sell virtually anything on the platform and it can be a great way to grow a business.